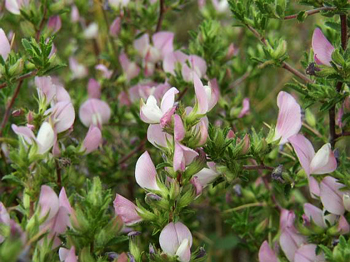 Restharrow is a shrubby perennial plant; the plant’s deep, sinuous roots produce spiny, much-branched stems which are woody at the base and which grow from 1 to 2 feet high. The alternate leaves are simple near the top and pinnate near the bottom, with 3 serrate, oblong leaflets. The rose-colored or white, papilionaceous (butterfly-shaped) flowers grow singly or in twos and threes in the leaf axils from June to August. The fruit is an ovate, hairy pod. It is fairly common in dry meadows, pastures, fallow land, and limestone soils in Europe and sometimes cultivated as a garden plant in the United States. Known primarily for its diuretic properties, which are effective but act without negative side-effects. Good for edema and water retention, especially uric acid retention and are thus susceptible to gravel and stones. Recommended for urinary catarrh, kidney inflammations, and rheumatism. A decoction of the roots can be used externally for eczema, itching, and other skin problems. Infusion: steep 3 to 4 tbsp. roots in 1 cup hot water for 5 minutes while stirring. Take 1 to 1 1/2 cups per day, warm. Decoction: soak 2 tsp. roots in 1/2 cup cold water for 8 hours, then bring rapidly to a boil.